The San Francisco Peace and Hope 2018 Fest is a celebration of the arts, honoring the Bay area literary spirit. 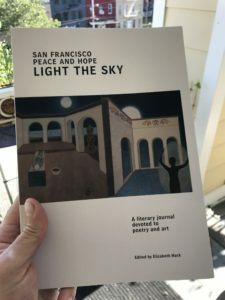 The new book, San Francisco Peace and Hope: Light the Sky will be launched. The event is being held at Arise Gallery, 678 Portola Drive in San Francisco on Sunday, July 1st from 1-3pm. Music by harpist Jack Pantaleo. The program includes featured readings and presentations by poet and artist contributors in the anthology. Through poetry and art we will reflect on these challenging times as we celebrate the changeless aspects of life. Bay area poet Kit Kennedy is the emcee for the event. Welcome by artist and Pastor Stacy Boorn. Elizabeth Hack, Founding Director and Editor will give a short talk. Deborah K. Tash, SFPH participating artist and poet is also the Curator of Special Exhibits at Arise Gallery and will be on hand to answer questions concerning the gallery. No open mic. Light refreshments served. San Francisco Peace and Hope www.sfpeaceandhope.com is a print and online literary publication that promotes peace through poetry, writing, and visual art.